Women's Summer Evening Tennis League, Princeton, Montgomery, New Jersey area. Women's Summer Evening Tennis League, Princeton, Montgomery, New Jersey area. 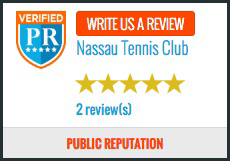 Welcome to Nassau’s SUMMER EVENING DOUBLES LEAGUE! You Pick the Days You Can Play to Suit YOUR Needs. The league is a 10 week session. Matches are on Tuesdays and Thursdays in June, July and August. Out of 20 possible evenings to play, you pick a minimum of 8 … ANY 8! Play all 8 matches in just four weeks (both Tuesday and Thursday), play just one match a week, take one week off and play twice the next week… whatever works for your schedule. The Possibilities are Many, and You’re in Charge! FORMAT: Choose 8 (or more) days below to play round-robin doubles. Each time you play there will be a mix of partners and opponents from all who are signed up. DAYS AND TIME: Tuesdays and/or Thursdays, 6:30 – 8:00pm, June – August. RAIN or SHINE! COST: $112 for eight rounds/$120 for non-members (minimum). Sign up for any additional rounds at only $8/round. All Levels Welcome! Each week we’ll organize the matches by ability from the list of all available players. Register for the Summer Round Robin starting in May.